Netsparker Enterprise is an online multi-user web application security solution. You can have a Netsparker Enterprise user for every team member. You can create as many new users as you need (there is no limit). Adding all your developers, QAs and other team members to Netsparker Enterprise helps you ensure that everyone who is involved in the development and upkeep of your web applications can do what is required to ensure their long term security including addressing all vulnerabilities quickly. 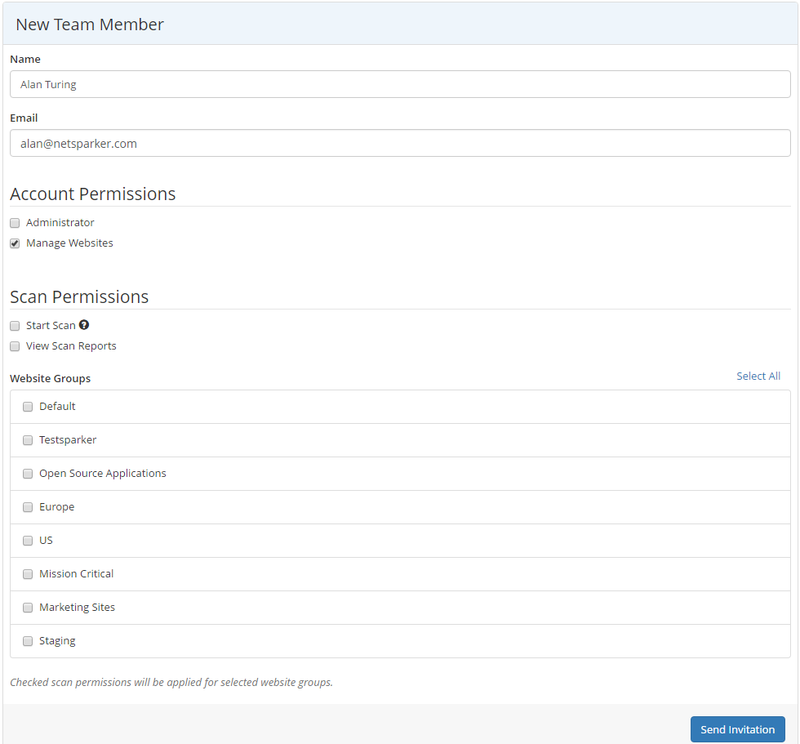 From the Team window, Account Owners can invite new team members and configure their permissions, including for website groups. For further information, see User Permissions Matrix in Netsparker Enterprise. From the main menu, select Team, then New Team Member. Complete the Name, Email and Phone Number fields. In the Account Permissions section, enable the relevant options. (For further information, see User Permissions Matrix). In the Scan Permissions section, enable the relevant options. If you are not allocating the user Administrator permission, you will also need to specify which Website Groups they can control.